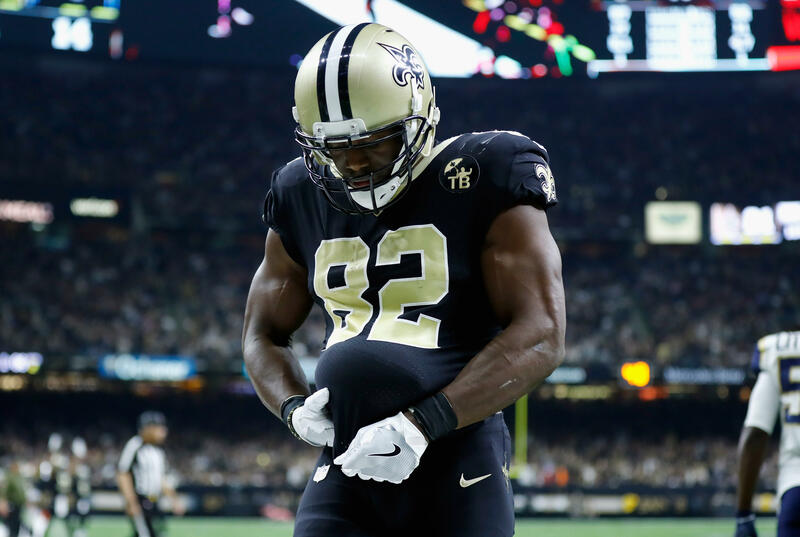 New Orleans Saints tight end Ben Watson made a heartwarming touchdown celebration worth a lot more than six points during the team's 45-35 victory over the Los Angeles Rams. He announced his wife was pregnant with twins in spectacular fashion. In the second quarter of Sunday's game at the Mercedes-Benz Superdome, Watson hauled in a touchdown catch from quarterback Drew Brees. He proceeded to put the ball underneath his jersey and hold up five fingers, the number of children he currently has. Then he put up two more fingers, letting the world know a pair of newborns on are on the way. After much speculation during the game, Watson confirmed the news and revealed his wife Kirsten had gone through a "few miscarriages over the past years." "It's been really tough," he said. "We said we would try one more time. And now she's pregnant not with just one baby, but with two." The 14-year football pro was previously fined for a celebration announcing his wife's earlier pregnancy in 2008, but likely won't face any penalty this time around. "We're going from Watson Five to Watson Seven in several months here," he said. "We're really excited and want everyone to pray for us." Teammate Michael Thomas also had a memorable celebration during the game. After his 72-yard catch, he paid homage to former Saints receiver Joe Horn with a hidden cellphone — one of the most recognized celebrations in NFL history.